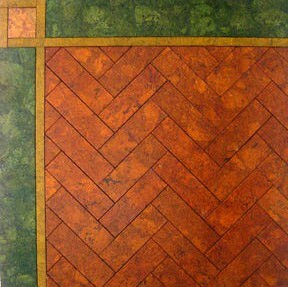 Parquet Cork Flooring. Photo courtesy CorkFloor.com. Resilient and warm underfoot, natural in appearance, and made from an environmentally sustainable material, cork makes an excellent flooring surface. 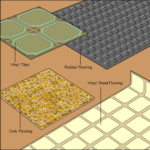 It is sold both in thin 12-by-12-inch tiles and thicker interlocking 1-by-3-foot planks. 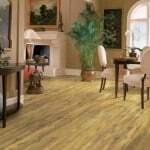 Most flooring dealers offer a range of earthy appearances, from light, unstained surfaces to bold hues. Most cork flooring is prefinished. Using natural cork flooring is a responsible way to help protect the earth’s forests. Every nine years, cork is peeled from the bark of cork oaks, which grow primarily in Mediterranean regions. Because only the bark is removed, each cork tree remains alive and vital. The material used for cork flooring is not overly soft and fragmented like familiar bulletin board cork. On the contrary, cork flooring is surprisingly rugged. It does not retain furniture “dents” as readily as do carpeting or vinyl flooring. Cork planks also have superb insulation qualities. Up to 90% of their composition consists of gaseous material, giving cork flooring excellent acoustic and thermal insulation properties. Suberin, a naturally occurring substance found in cork, helps the material resist liquid, protecting it from moisture deterioration. Also, suberin is an organic insect repellant that targets, among other things, termites. Cork is also hypoallergenic with anti-microbial agents that protect it from mildew. Like laminate flooring, cork floor planks are typically “floated” over a flat, smooth subfloor. An experienced do-it-yourselfer can usually handle installation. Planks are cut using a power saw and, in most cases, snapped together without the need for glue. Cork tile can be cut with a knife; it is set in cork flooring adhesive. To maintain the look, reapplication of a polyurethane finish may be required every few years. It is possible to sand and refinish the floor, but it’s imperative not to sand the cork itself. The installed cost of a cork floor typically runs from $5 to $10 per square foot. By doing the work yourself, you can save up to about $2.50 per square foot. For everyday maintenance, standard sweeping and mopping are recommended. In addition, you can use a combination of mild detergent or white vinegar combined with small amounts of water to get a deeper clean. To maintain withering tiles, buff them with a liquid polish.